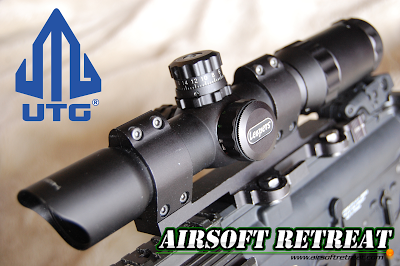 Long eye relief, variable magnification scopes are one of the most useful optics that you can use in airsoft, mainly due to their flexible mounting requirements, and their ability to be used with both eyes open. UTG makes several long eye relief scopes, but this model, the 1-4x28 is designed for CQB use, and is pretty much perfect for airsoft. It is compact, and gives you true 1x zoom, and had a 30mm tube, allowing you to use modern tactical mounting systems, like the Larue SPR mount. I will discuss the various aspects of this unique optic in this review! I obtained this scope directly from UTG, who sent it to be reviewed here on Airsoft Retreat! It is available at several retailers, including Pyramyd Air, Airgun Depot, or Optics Planet, priced at about $90. Leapers offers a good warranty, as well as after-sale support on their products, so if you happen to have any issues with your optic, it will be taken care of. This optic comes packaged in a cardboard box, complete with removable flip up scope caps, a cleaning cloth, two batteries, an allen wrench, a Mil-dot reference card, and a manual. It does not include rings, so you will need to provide your own in order to mount the scope. Everything came individually wrapped, to prevent any damage during shipping. As mentioned, the scope being reviewed today is an illuminated, long eye relief (about 5-6"), full metal optic, with variable zoom between 1-4, and a 28mm objective lens, hence the 1-4x28 designation. The main tube diameter is 30mm, with a mounting area of 116mm between the two flared out ends. It isn't the lightest scope in the world, coming in at 14 oz, but, depending on how you have it mounted, it won't be too noticeable. You don't have too many options as far as short dot style scopes go, as most of them are either prohibitively expensive, or made by manufacturers of unknown reputation, making the UTG a fantastic option. The overall length without the lens caps installed is just shy of 10”, making this a very compact scope. It fits perfectly in a Larue SPR 1.5 mount, however, if using other fixed ring length mounts, you will want to ensure that it will fit between the flared out ends. The variable magnification is changed using the large hand adjustable dial located in front of the eyepiece, and is adjustable between 1 and 4x magnification. It is marked in 0.5x increments, allowing you to fine tune the magnification for your use. At 1x magnification, there is a slight fish bowl effect at the edges of the field of view, which is slightly noticeable when using it with both eyes open, but it didn't effect its usability for me. With the other zoom levels, it works extremely well, and the low magnification levels are perfect for airsoft use. Being a long eye relief scope, you can mount it more forward on your gun. For real gun use, this is helpful to prevent hitting yourself in the face when firing heavy loads. In airsoft, its mainly cosmetic, however, having the scope mounted farther up on the gun allows you to retain a wider field of view with both your dominant and non-dominant eyes, as you can easily use it with both eyes open. Adjusting windage and elevation is accomplished using the hand adjustable target style turrets, which feature a unique locking collar to prevent accidental changing of the settings. The knobs are ribbed to allow you easily grasp them, even while wearing gloves. They also have a zero reset function, allowing you to rotate the turret markings to the “0” point once you've dialed it in, to visually determine whether they've changed from your setting. I will discuss this feature in the next section. The red/green illumination has five brightness settings, and is easily activated using the left side mounted rheostat dial, which doubles as the battery housing. It uses a single 2032 button cell battery to power it, and the different brightness settings allow you to use it in a variety of lighting conditions. Illumination is bright and crisp, without too much visibility from the target side. The objective lens features an integrated angled sunshade, to prevent glare from interfering with your shooting. Cosmetically, this is where UTG differs from most short-dot style scope manufacturers, but it is a functional addition that adds a unique look to the scope. The objective lens has an emerald coating for improved light transmission properties, without effecting the coloration when looking through the optic. The scope uses an etched glass reticle, instead of the relatively fragile inner wire reticle that some other optics use. This gives you one of the clearest and most robust reticles available, with integrated Mil-dot range estimation. Refer to the included card for easy range estimating procedures, based on target size and Mil-dot measurement. A pretty scope is useless if it doesn't work, but thankfully, this scope works perfectly. In order to use it, you must first choose how you want to mount it to your rifle. In my case, I used an ACM Larue SPR-1.5 mount which I found at Ebaybanned. It was affordable, rock solid, and was practically designed for scopes like this. Once mounted up, I threw it on a few of my AEGs for testing. Zeroing the scope is simple, as it requires no tools whatsoever, however, if you want to use the zero reset function, you must use the included hex wrench. First, you must loosen the locking collar, which keeps the main turret from being rotated. Unscrew it slightly counterclockwise, and the turret will be free. Once the collar is loosened, you can rotate the main turret to your desired setting. It clicks between the different points, and is marked as changing the point of impact 1/2” per click at 100 yards. You'll notice that it has numerical markings on the turret, with a reference dot on the center position. This is used for the zero reset function, which I will discuss in a moment. Once you've dialed in the scope to your desired setting, you will want to use the zero reset feature to return the indicator to the “0” mark on the dial. Unscrew the hex screw on top of the turret between a quarter and half turn, which will free the dial to rotate without changing the zero. You will know that it is in this mode, because it will no longer click while rotating. Rotate it so that the reference dot is on zero, so that if you change your zero settings for a particular shot, you can easily return it to “0” to go back to your original setting. One of the nice features of this optic is the red/green illumination, allowing you to easily see the reticle in all lighting conditions. When used, only the inner portion of the reticle is illuminated, instead of the whole thing on some optics. The variable zoom is the most useful feature in my opinion, as it can basically change your gun from easy use in CQB, to longer range targeting in seconds. When at 1x zoom, the scope can almost function as a more precise reflex sight, as you can just put the crosshairs over the target and pull the trigger. For more precise shots, increase the magnification, with no noticeable change in eye relief. I experienced no loss of zero in my use, albeit on airsoft replicas only. I will be mounting this on my 7.62 WASR-10, to see how it handles something with more recoil, however, I don't predict any issues, as Leapers builds their products for real steel use anyways. Airsoft use is barely even touching their optics durability requirements, so it should take any abuse we throw at it just fine. Now for some glamour shots of the scope mounted on a variety of gun platforms. As you will see, it looks good on both short and long guns, due to its compact size and unique design. I have been looking for an affordable long eye relief/low magnification optic for quite some time, but the only options I was finding were either extremely expensive, or made by unknown manufacturers with no after-sale support or warranty. Leapers has changed that with the SCP3-1428L1, giving you pretty much everything you could want in a compact short-dot style scope, at an affordable price, and with US based support if needed. For those that prefer 1” tube, they have a model with 1.25-4x magnification, and a 24mm objective lens, however, I much prefer the true 1x zoom offered by this model. At SHOT show, they had some new models in the prototype phase that looked very impressive, so we have more to look forward from Leapers/UTG this year! Many thanks again to UTG, and of course, Airsoft Retreat!